I loved it so much because it hit home. It is sometimes SO hard to take the first step toward something new. Fear can take over, and often it does. It got me to thinking about some of the first steps I have taken in my adult life that I could have not taken out of fear, but am so glad I did. A step to start learning how to play tennis in my late thirties. A step to start a business. A step to start another business. Sign up for a half marathon. A step to sell my house from a pure gut feeling that I should. A step to see a therapist. A step to start attending church. A step to try online dating (ugh). A step to face facts and clear personal debt. Sometimes it’s easy to get lost in the hustle and even get frustrated when success takes a while. This applies to work, learning a new skill, trying a new sport, and even working on breaking bad habits. 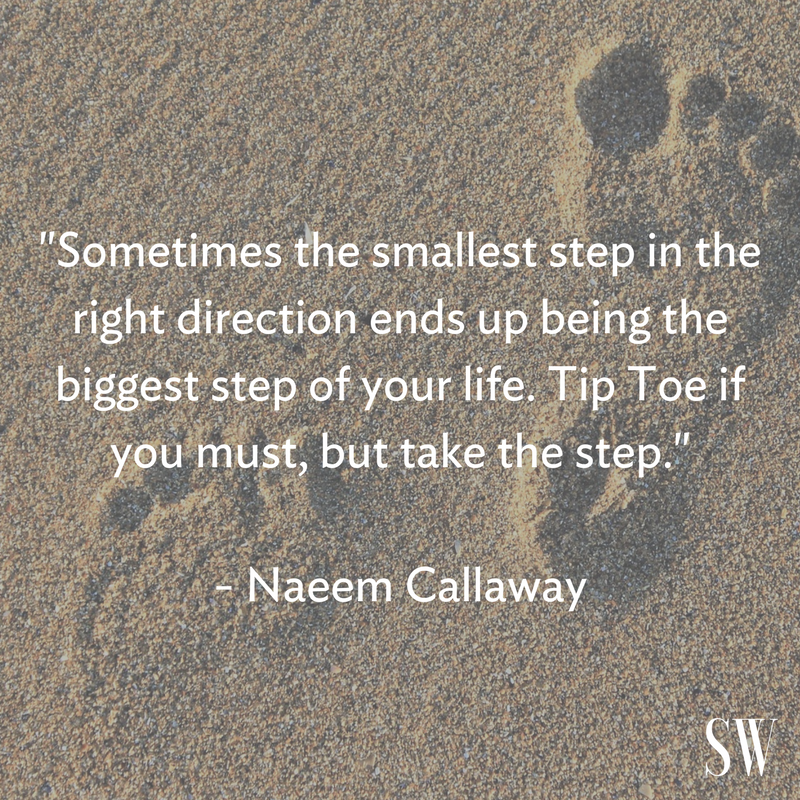 In my book, you’ve already hit success by simply taking a step. A step toward a commitment. A step into something new, something you’ve never done before, something that might even scare the hell out of you. The first step is often the hardest and if you have the right perspective, the most successful. If we don’t take the step, we stand still. We have to accept that we are standing still because we’ve chosen to stand still. At the same time, we have to acknowledge that we can never complain about anything…ever…because we have chosen to not take the step. So it’s just us and our excuses. A question we all ask ourselves. That question becomes paralyzing. Imagine yourself paralyzed and never moving. Always having to be happy about the current status of your relationships, your income, your health, your weight, your lack of time to spend with your kids. None of it ever changing. Are all of those things perfectly perfect in your life right now? Doubtful. They may never be, and I can’t guarantee that if you take whatever first steps you’re thinking about taking that they will become better. However, nothing sounds worse to me than becoming complacent and accepting something for what it is when it has the potential to be better. Standing still…always. Never moving. The first step won’t be the last. So take the step. But, there is that fear voice again. What if you fail? So what. You’re likely not off any worse than you were before, but at least you are making an effort. It’s a process. A journey. Take another step. Keep trying. Stop standing still. All of our activities are planting seeds to something bigger. The activities can at times feel minor, tiny, and mundane. Sometimes it even feels like we take one step forward and then two steps back. Just remember, that sometimes you have to take those backward steps before you can achieve the second forward step. And other times those backward steps and the ways you overcome them are like taking giant leaps forward. It’s all part of the process. It’s a journey. But none of it will exist if you don’t take the first step! So whatever the heck you’re thinking about doing, stop thinking and start doing. Pour a drink, and take the freakin’ step!